Union Olimpija Ljubljana pleased its outstanding fans with a thrilling win in the team's last home game in the Turkish Airlines Euroleague season by downing BC Khimki Moscow Region 74-72 at Stozice Arena in the Slovenian capital in Group A on Friday. Olimpija improved to 3-6, but had already run out of chances to reach the Top 16 last week. Khimki dropped to 5-4, but has already reached the Top 16. Klemen Prepelic was the hero by nailing the game-winning three-pointer at the buzzer. He also paced the winners with 16 points. Jaka Blazic added 13 while Sasu Salin, Aron Baynes and Drazen Bubnic each had 11 for Olimpija. Baynes added 10 rebounds for a double-double. 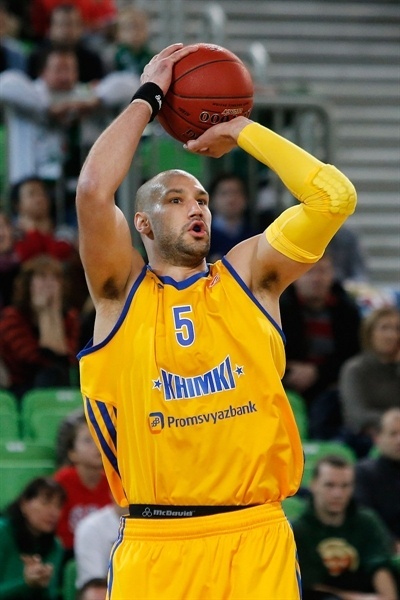 Paul Davis led Khimki with 20 points on 10-of-11 free throw shooting. 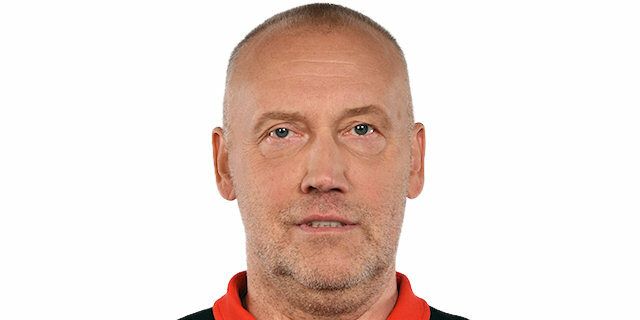 Vitaly Fridzon added 12 while Egor Vyaltsev had 11 for the guests, who were without Zoran Planinic and Petteri Koponen. A three-pointer by Alexey Zhukanenko and a free throw by James Augustine gave Khimki a 65-70 lead with 16 seconds left, but Blazic and Salin struck from downtown, Fridzon missed free throws and Prepelic stole the show with the game-winning shot right at the buzzer! Davis got Khimki going with a turnaround jumper, as Olimpija struggled to score in the opening two minutes. A baseline jumper by James Augustine and free throws by Davis soon gave Khimki a 0-6 lead. Blazic shined with a driving layup and Aron Baynes erased Fridzon's jumper with a put-back slam. Luka Rupnic scored in penetration but Vyaltsev answered from downtown to boost the guests' lead to 6-11. Olimpija tried a more dynamic backcourt off a timeout, bringing Jan Mocnik and Prepelic off the bench. Baynes kept pacing the hosts with a three-point play but a coast-to-coast layup by K.C. Rivers gave Khimki some fresh air at 9-13. Khimki kept running its offense through Davis, who followed a baseline jumper with free throws. Baynes scored down low, but Vyaltsev erased that with a put-back basket. Baynes dunked it to bring Olimpija within 13-19 after 10 minutes. Prepelic ignited the crowd with a wild four-point play early in the second quarter, as Khimki tried twin point guards with Vyaltsev and Dimitry Khvostov together on court. 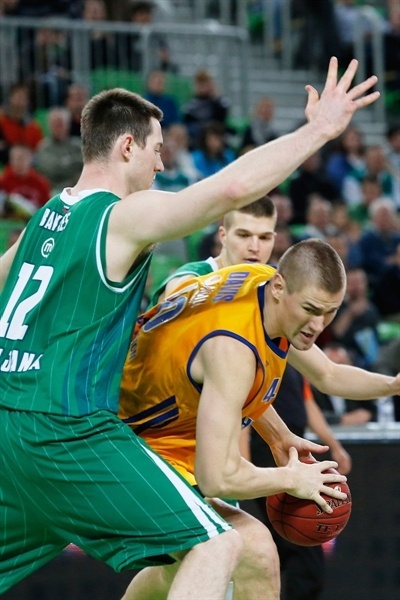 Vyaltsev buried a triple and free throws by Bubnic brought Olimpija within 19-22. Vyaltsev insisted from downtown and Teemu Rannikko made free throws to trim the gap to 21-25. Bubnic scored around the basket, as Khimki kept struggled to score against the hosts' aggressive defense. Davis returned to the floor and immediately delivered with free throws, but Bubnic matched that with a floating layup. Matt Nielsen stepped up with a long jumper only to see Prepelic and Bubnic tie it at 29-29. Augustine scored around the basket before Blazic matched that with a jumper. A buzzer-beating three-pointer by Salin completed the hosts' comeback, 34-31, 1.4 seconds before halftime. Third quarter: Great intensity, great crowd! Salin nailed an eight-meter bomb immediately after he break, as Khimki kept struggling to find the way to the basket. Salin insisted with a mid-range jumper to boost the hosts' lead to 39-31. Fridzon scored around the basket and added a fast break layup to keep Khimki within 39-35. Olimpija, pushed by an incredible crowd, did not give up. Salin nailed another triple and Bubnic beat the shot clock with a baseline jumper, good for a 44-35 Olimpija lead. Augustine buried a jump hook that Blazic matched with a put-back layup. Davis hit foul shots and followed that with a three-point play, which gave Khimki hope at 46-42. Alen Omic shined with a two-handed dunk, but Davis and Sergey Monya brought the guests even closer, 48-46. Davis kept pacing Khimki with a fast break layup, but an aggressive Blazic erased it with free throws. A layup by Nielsen tied the game, 50-50, through three quarters. Omic scored around the basket early in the fourth quarter and free throws by Blazic gave Olimpija a 54-50 lead. Fridzon stepped up with a three-pointer, but Dino Muric shined with a second-chance layup and Prepelic struck from downtown to force Khimki to call timeout at 59-53. Muric scored again, but Monya tried to ignite the guests' comeback with a fast break slam. Davis added a breakaway layup to cause Olimpija to stop the game at 61-57. Olimpija could not find the way to the basket and Rivers sank a floating layup in transition to make it 61-59. Baynes and Prepelic hit free throws, but Zhukanenko hit a rainbow jumper and Rivers added a driving layup for a 65-63 score with two minutes left. Fridzon split foul shots and Rivers put Khimki ahead, 65-66, with 1:15 to go. Muric missed down low and a three-pointer by Zhukanenko made it 65-69 with 35 seconds left. Augustine split free throws and a triple by Blazic gave Olimpija hope at 68-70. Fridzon made free throws, but Salin quickly answered from downtown. Olimpija fouled Fridzon again, but he missed both attempts. It all came down to the final play, in which Blazic fed Prepelic for the game-winning shot right at the buzzer! "This victory is for the fans. I want to congratulate my players on a great job. We played good defense for 40 minutes, and this paid off in the end. We couldn't get our offense running in the first half, but we changed some things in the second, and it paid off. My players left their hearts out there and I am very happy we won the game." 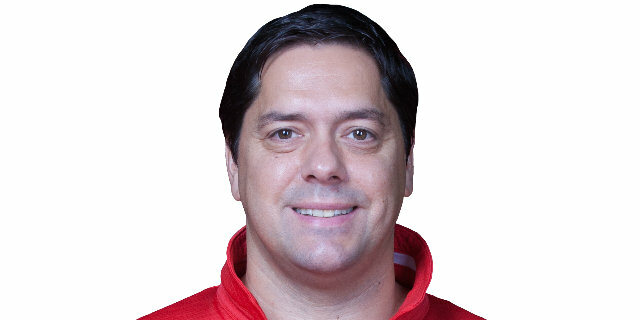 "Congratulations to Union Olimpija and their coach Filipovski for the deserved victory. This game is a great example that you have to play until the final buzzer. We didn't play smart in the clutch situations. We allowed them too many offensive rebounds. Again, congratulations to Union Olimpija on well deserved victory. I wish them the best in the future."